Founded in 1995, British Journal of Healthcare Management is the leading monthly journal focusing on management and leadership trends as they affect the healthcare sector. The landscape of healthcare is changing, and those changes demand that healthcare managers uncover new levels of innovation and efficiency. 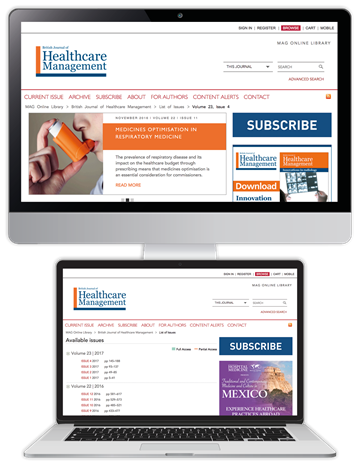 British Journal of Healthcare Management is committed to giving healthcare managers the latest information so that they can better help healthcare providers balance quality of care and affordability. "Every issue of British Journal of Healthcare Management provides NHS managers with crucial insights into healthcare provision. Filled with financial, clinical, legal and management advice, every article is written and reviewed by a prestigious editorial board, drawing on a wealth of knowledge and experience, to help readers enhance service delivery."